Brentwood was not to prove as convenient a location as had been hoped, and in 1885 the Club’s home ground was moved to Leyton. It moved again later to Chelmsford, where it remains today. 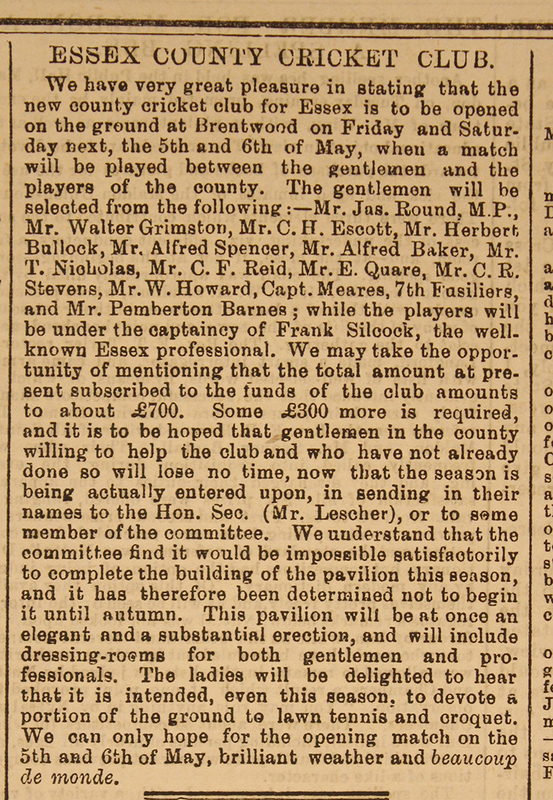 Early Essex sides were mostly composed of amateur players, with one or two professionals, such as cousins Frank and Joseph Silcock. Despite their professional status, Frank and Joseph both still had other occupations. Frank, born in 1838 in Sawbridgeworth, appears in most census returns as a sadler, with the exception of 1881 when he was described as a ‘Cricket Outfitter’. Joseph was a harness maker, and in 1871 he was also running a beer house. The name of his pub? The Cricketers. 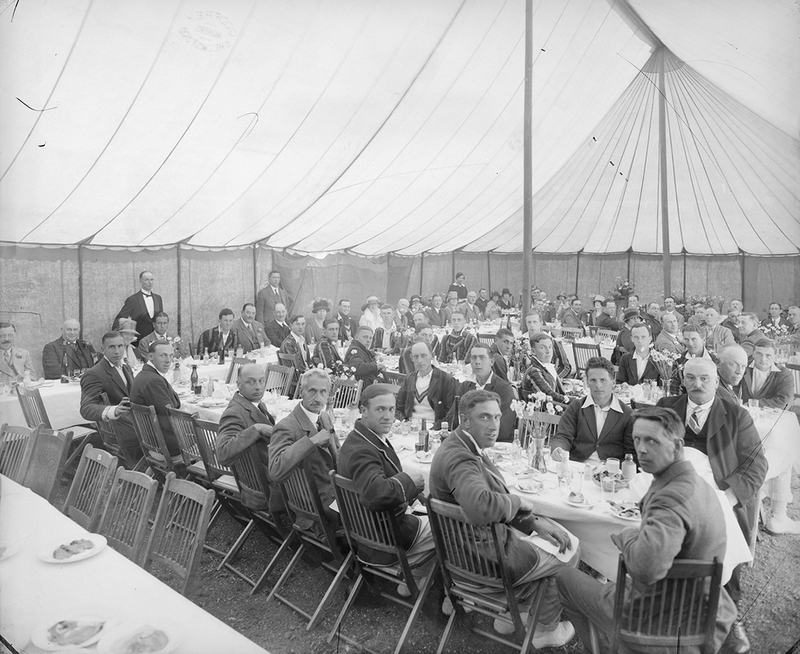 Essex has had its fair share of eccentric results over the years. 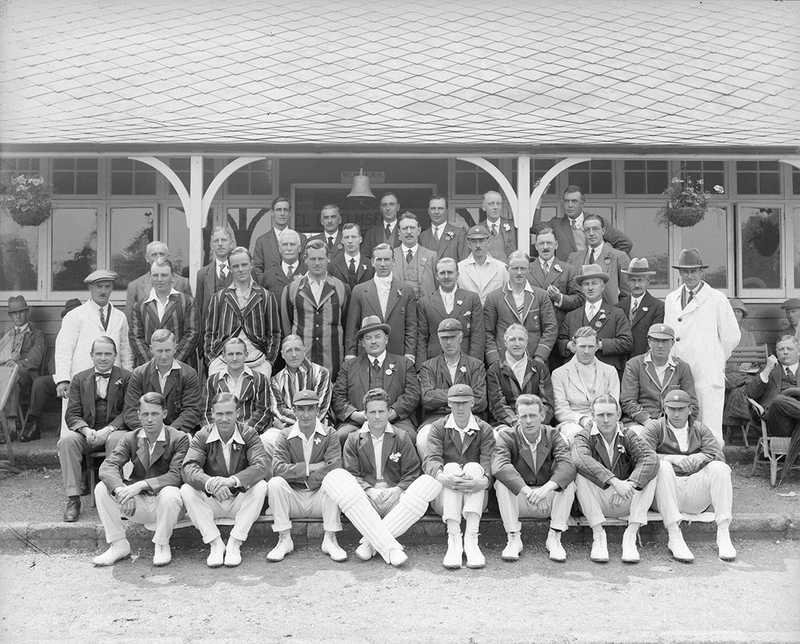 On more than one occasion they have snatched defeat from the jaws of victory; perhaps the best example was their game against Derbyshire on 19-20 June 1904. Essex scored 597 in their first innings, but went on to lose by 9 wickets. 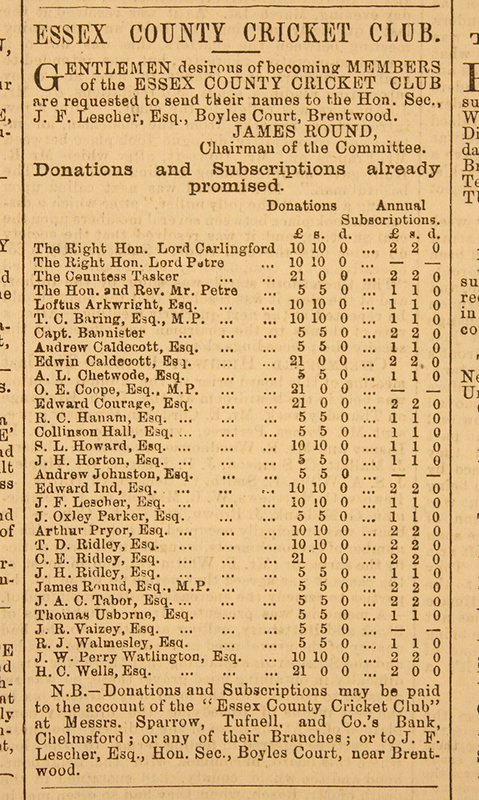 343 of those runs belonged to Percy Perrin. His innings included 68 fours, and remains the highest score by an Essex player. Another Essex record was scored by John “Johnny” William Henry Tyler Douglas in another game against Derbyshire, this time in 1921. In this extraordinary game, Douglas saved the Essex innings with S.N. Hare, who together put on a 9th wicket partnership of 251. 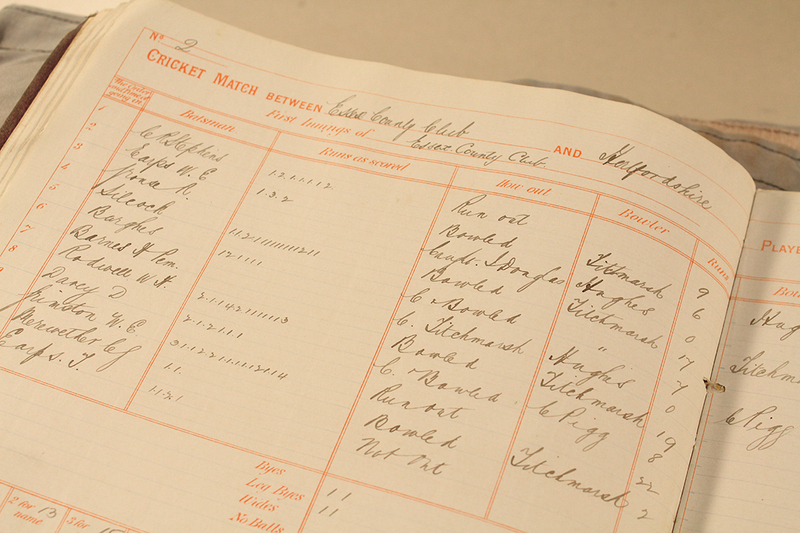 Douglas himself scored 210 – his highest batting score – and also got his best bowling figures – 9-47 and 2-0. Essex won the game by an innings and 74 runs. Douglas was a significant figure in the development of Essex cricket. He first played for the county in 1902, then remained there from 1904. He was captain from 1911-1928. Seven times he took over 100 wickets in a season, with a best of 147 in 1920. He also played for England (and captained them), and an Olympic boxer. He was killed in a shipwreck off the coast of Denmark in 1930. May and June 1934 were a rollercoaster ride for Essex. A massive loss to Kent by an innings and 192 runs was followed immediately by a win against Surrey – by an innings and 192 runs. We wish our county team luck with the new season as it begins in a few weeks.